The strongest and fastest sled dogs are often some mix of Siberian huskies, Yakutian laikas, Siberian laikas, Kamchata or Chukotka sled dogs. This family had over fifty handsome, healthy, friendly sled dogs. 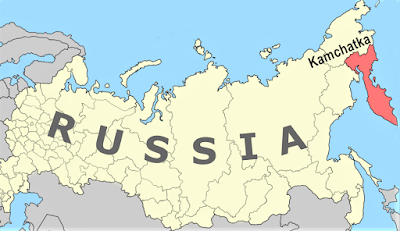 Kamchatka (Камча́тка) is the big, remote peninsula in far eastern Russia. It's the most volcanic part of Eurasia with about 300 cones and more than two dozen active volcanoes. This geothermal wilderness has few inhabitants ~ only about 330,000, mostly ethnic Russians, in two small cities. 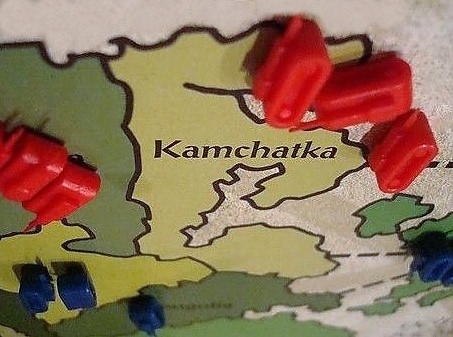 First heard of Kamchatka playing Risk in college (when needed to be studying). Kamchatka was a pivotal strategic spot on the game map. We'd joke about someday actually going there. Kamchatka's "Valley of Geysers" (Долина гейзеров) is one of the world's biggest concentrations of geysers and hot springs. (with rifle in case of any angry brown bears). Powerful Geyser Bolshoy conveniently blasts about hourly. Another helicopter ride takes us to the sulfur hot springs and bubbling mud pits (and occasional brown bears) of the Uzon Caldera (9x12km). Brown bears basking in the sun and the breeze at the Uzon Caldera. Viewed from our helicopter, the perfect symmetrical cone of the Karymsky volcano, erupting continuously since 1996. Helicopter also allowed nice views of the compound Maly Semyachik volcano including this hot, acidic, creamy blue, crater lake. 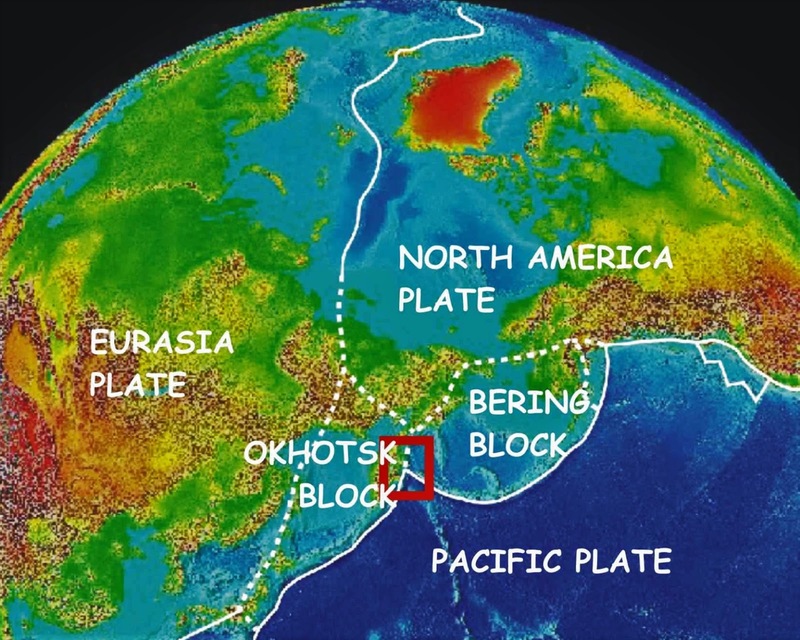 Three tectonic plates (Eurasia, North America, Pacific) collide at Kamchatka! 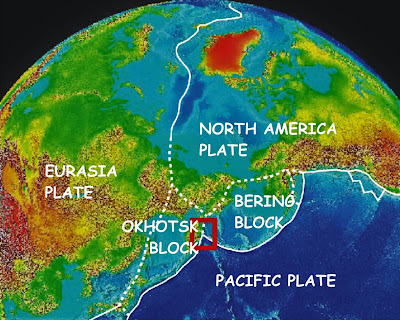 Just north of Petropavlovsk-Kamchatsky, the provincial capital, is a another row of volcanoes. Some like these two ― Koryatsky and Avachinsky ― are still active. We spent five hours one day cruising on a small boat around Avancha Bay. It was foggy and gray in the morning when we passed the rocks called "Three Brothers." The fog lifted and we were treated to scenic coastline of Avancha Bay. Sea birds have claimed every nook and ledge on the outlying rock walls. Nearby otters and seals were sunbathing. Fishing in Kamchatka is popular for locals and (mostly Russian and some Korean) tourists alike. Had not fished in years, but was lucky and caught a flounder right away. It was served at lunch. Top: A Russian Coast Guard ship where one afternoon task was fishing. 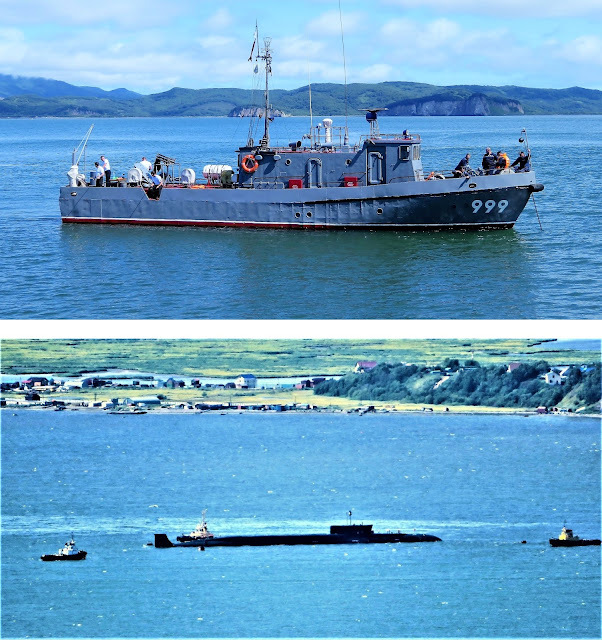 Bottom: Nuclear submarine departing from Russia's largest submarine base. One morning we had a chance to see salmon splashing around and spawning. Never got the perfect closeup but all those waves and dark spots in the stream are salmon. One of the best afternoons was spent at the "sled dog and ethnic cultural center." (Trying to find a URL for it.) These two talented singers, dancers, cultural educators gave us engaging lessons in the traditions of the indigenous peoples of Kamchatka. The Center raises prize-winning sled dogs who compete in Kamchatka's Beringia race (Russia's answer to Alaska's Iditarod). In the summer they continue to exercise the dogs, even using a visiting tourist for a heavy practice load. Bumpy, wild, exhilarating, ridiculously fast. And who wants a safety helmet anyway? Petropavlovsk-Kamchatsky (Петропа́вловск-Камча́тский) had good museums and lovely churches, but I wanted my highlight photos here to focus on the great outdoors.